This fully refurnished summer house is situated in HORA, one of the few perfectly preserved heritage villages of Greece which is built around a monastery at the top of the hill. Many thanks for your interest in our Hotel! 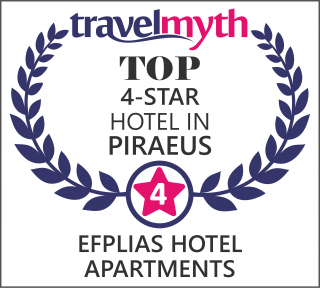 We are a small 4**** luxury apart hotel ideally located in the heart of Piraeus. Walking distance to all exits to boats in Akti Miaouli and the cruise ships Port. In our small paradise there are 22 fully serviced, one or two bedroom comfortable suites, individually designed to the highest standards. In all rooms you sleep on a Coco Mat bed and you feel the hospitality we offer you by everyday cleaning and 24 hour concierge service. We make each of you feel at home when you are away from home!! Specially designed rooms for disabled people. Please see on the next pages the room amenities and more details about the hotel. Note that we are the highest standard for Hotel Apartments. Book now or call us.